Born in Puerto Rico and based in Columbus, Ohio, Rafael Rosado is a seasoned writer, director and storyboard artist for the animation industry. He began his career at Character Builders in Columbus, Ohio as an assistant animator. He quickly worked his way up to become a character designer, storyboard artist and commercial director. During his tenure there he worked on such shows as Fox's Emmy Award-winning Life With Louie, HBO's Happily Ever After and Fox's Where in The World Is Carmen San Diego. After leaving Character Builders in 1994, Rafael went to work for Warner Brothers Animation, storyboarding on Pinky and The Brain and Emmy nominated Animaniacs, for which he also wrote two episodes. He was the recruited by the newly-founded Sony Television Animation division, where he worked on eleven shows including directing episodes of CBS's Project GeeKeR and NBC's Sammy. He was promoted to Supervising Director on Extreme Ghostbusters and Producer on Men In Black: The Animated Series. After 5 years honing his skills in Los Angeles, Rafael moved back to Ohio to raise his family. He is now one of the most highly sought-after storyboard artists, working for major studios such as Warner Brothers, The Walt Disney Company, Sony, Universal and the Cartoon Network. Highly diverse, he has storyboarded on action, comedy and pre-school shows, shows as diverse as Boondocks, Teenage Mutant Ninja Turtles, The Batman, The Venture Brothers and Curious George. 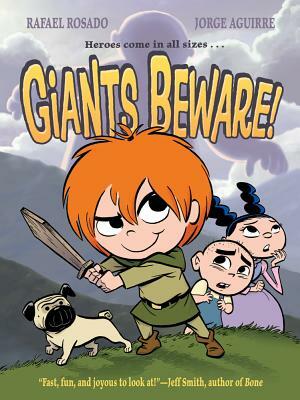 Rafael's first graphic novel, Giants Beware!, was published by First Second Books in early 2012. His short film The Tortured Clown was acquired by and featured on the Sundance Channel. Jorge Aguirre is a Colombian-American from Columbus, Ohio. He’s written for everything from the most popular children’s shows to documentaries about Romanian exorcisms. He is the author of Giants Beware! He lives on the East Coast.